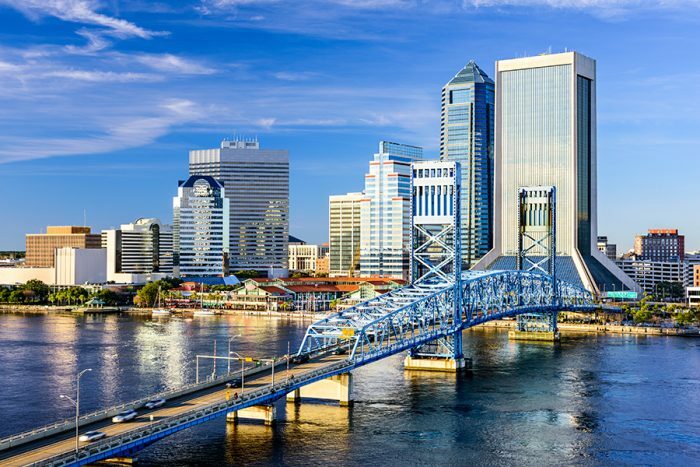 Relax on the miles of white sandy beaches, shop and dine in unique areas, and tap into the bustling culture that is Downtown Jacksonville. It’s a mix of Old South atmosphere and Mediterranean architecture, with gleaming high-rises and stately residential neighborhoods. This is a guide to the best places to run in Jacksonville. Jacksonville is geographically very large. The beaches are 17 miles east of downtown. 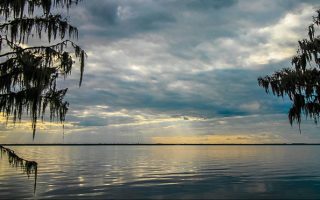 The twisting St. John’s River is the geographic highlight. Downtown is divided into northwest and southeast sections by the river. The bulk of downtown lies in a broad crescent on the north bank, while the city’s smaller, thumb-shaped south bank sector consists mainly of the historic community of San Marco. Jacksonville is a great city for running. From beautiful beaches to scenic trails, the city was picked as one of the “10 best places to run while you’re away from home” by USA Today! The two sections of downtown are connected by a half-dozen bridges, several of which you can (and should) run across. Then there are the beaches! 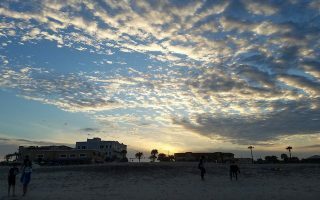 A string of resort communities collectively offer 20 miles of hard-packed white sand beaches, wide boulevards and off-road park trails on which to run. 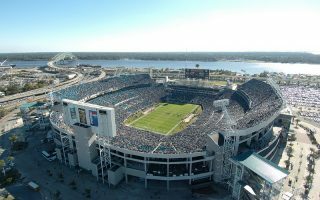 Run from Jacksonville Landing down the Northbank RiverWalk all the way to EverBank Field. If you go around the stadium and back the distance is just under 3 miles, plus you get to see the stadium! This run starts at the Lions, which reflect the neighborhood's association with the Venice, Italy business district. From there head down the picturesque San Marco Boulevard. 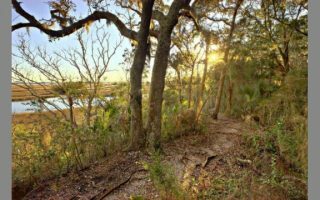 Hanna Park is a 450 acre park located oceanfront just north of Atlantic Beach. With cool ocean breezes along the way and a plunge in the surf after your run, this park is ideal for one of the hot days! 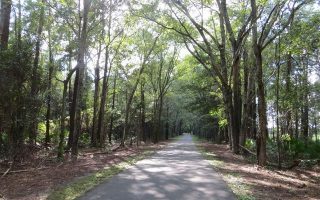 The Jacksonville-Baldwin Trail is 14.5 miles long and runs from Jacksonville’s westside to the small town of Baldwin. The trail is great for running as the surface is entirely asphalt. 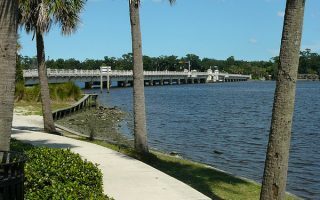 The Ortega neighborhood is bordered by the St. Johns River on the East, the Cedar River on the North, and the Ortega river on the West, practically making it an "inland island." 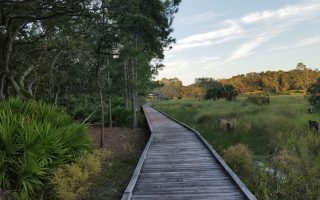 This park has approximately 9 miles of trails that wind through undisturbed maritime forest, with marsh and intracoastal waterway views. The Theodore Roosevelt Preserve covers 600 acres adjacent to the Fort Caroline National Memorial. The trails offer a lot of elevation, with some of the steepest hills you will find in the area. A nearly perfect 1 mile loop with intervals marked off with white lines on the road every 200 meters makes Forest Circle a go to for runners. 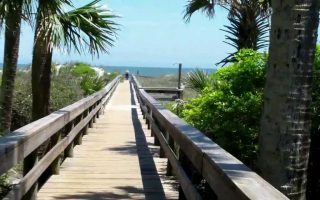 For some typical Florida running, consider an 11-mile strip of some of Florida's most gorgeous and relatively uncrowded beaches. Main Street and Acosta bridges offer a training ground for runners who need to add some altitude. The closest thing to hill training in Jacksonville. The Perfect 10 got its name not for it's beauty or terrain, but because it was measured several times. Although it is also one of the most scenic runs in Jacksonville! This diverse neighborhood reveals part of Jacksonville’s rich cultural diversity. A great run for hot days as it provides lots of shade & you can find the perfect fit gear at 1st Place Sports while you’re at it! Brought to you by USA Track & Field, this route starts off St. Augustine Road in Bartram Park, located in South Jacksonville. 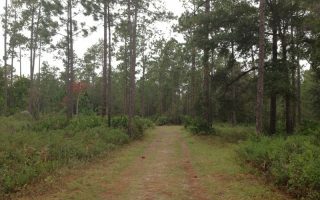 It has been said to be one of the best off-road courses in the Jacksonville Area. 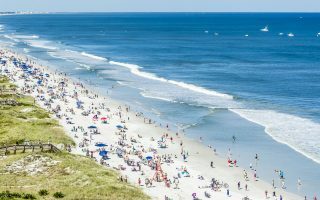 Amelia Island and its main city of Fernandina Beach are located just 40 minutes north of Jacksonville on a beautiful barrier beach between the Amelia River and the Atlantic ocean. Great beach running, bike paths, state parks, and scenery, plus a hip downtown area. Jacksonville has a humid subtropical climate. Summers are hot and wet, with high temps around 90F and near daily thunderstorms. 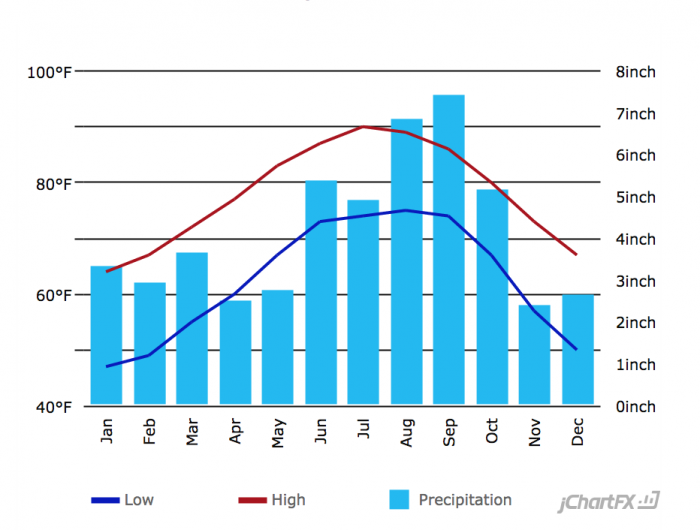 November through April is drier. Winters are typically mild and sunny. January high temperatures average in the mid 60s and it can be chilly at night. Bring layers. It’s not as warm as south Florida! 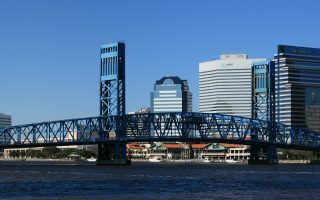 Whether you seek upscale resort settings, luxury downtown hotels, or cozy bed & breakfast inns, Jacksonville has lodging options to suit you. Over 18,000 guest rooms are located throughout the Downtown, beaches, and suburban areas. Area resorts offer an additional 11,000 rooms to visitors. All facilities share the area’s sun-drenched tropical climate and boast inviting Southern hospitality. Downtown: Graced by the beautiful St. Johns River, and minutes away from pristine white sand beaches, Downtown Jacksonville is truly unique. Cross over one of the seven bridges spanning the river or take a sunset water taxi ride for the best city views! The Riverside & Avondale Neighborhoods: Stroll through the charming tree-lined streets of historic Riverside & Avondale for fabulous antique shopping, cafes, and boutiques. View the world-class art collection at the Cummer Museum of Art and Gardens and don’t miss the exciting Five Points area for dining and shopping options with a hip, local twist. San Marco: San Marco is a historic neighborhood just a few minutes from Downtown. 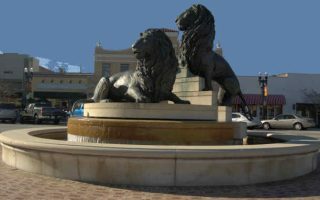 Visit San Marco’s distinctive boutiques and art galleries and enjoy the full-fledged dining district which has plenty of outdoor cafe seating and diverse options. Northside & Airport: Check out the Northside and Airport areas where you can visit the Jacksonville Zoo & Gardens or tour the Budweiser Brewery. 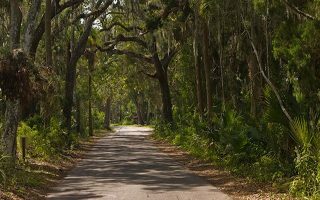 The beautiful Timucuan Ecological and Historic Preserve offers numerous outdoors activities and historic sites like Kingsley Plantation for a glimpse into the past. 1st Place Sports: Has been recognized as one of the Best Running Stores in America. With more than 30 years as Jacksonville’s Running Headquarters they know what it means for a runner or walker to be in the right footwear. 1st Place Sports manages over 50 races in Jacksonville each year, including the Gate River Run, the Jacksonville Bank Marathon, the Subaru Distance Classic, and the Jacksonville Grand Prix series of races. They take the time to understand your personal running and walking style to insure that you have what you need to achieve your fitness goals. Check out their weekly group running series here. Jacksonville Running Company: At JRC, they pride themselves on helping people improve their running experience. Whether it’s shaving a few minutes off your PR, or fnidng the best shoe that fits your running form, they are here to help. Check out their Running Club as well as their Weekly Group Runs. JTC Running: Northeast Florida’s preeminent promoter of healthy lifestyles through running, fitness, and fellowship. Current group runs include interval workouts at the Bolles School track as well as others at various locations during the week. JTCRunning’s newsletter “The Starting Line” and this web site have details. **There is an annual fee to join. This race takes place in December. 26.2 miles of beauty. 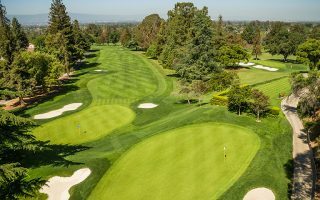 Large oak, magnolia and Maple trees line this very scenic and flat course. Starts and finishes at The Bolles School. Thanksgiving Day. Starts on San Jose Blvd just south of Baymeadows Road. Great course through some of Mandarin’s most scenic roads. Typically in May. A great course along the Riverwalk starting and finishing at the Hyatt Hotel on Coastline Drive.